Each Star Trek series had it’s epic Captain or Commander and fans either loved them or hated them. Who was your fav? Janeway was my favourite. Voyager was the first series I watched, so I grew up with Janeway. I found her 'mother' role very comforting to me as a child, and I love her personality. I'm about to give away that I'm a complete Star Trek newbie, but I can't get enough of Chris Pine's latest depiction of Kirk. Star Trek was something I always watched a little of growing up, and knew enough about to get pop culture references and the like, until the Star Trek film reboot hooked me! Sisko from DS9 was my fav. He didn't take crap from anyone, even though the Cardassians tried to push him around pretty hard. I also liked how his character handled the Dominion story arc. 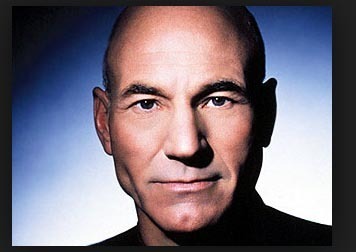 Jean-Luc Picard, I think. He didn't fit the charismatic, handsome model and picking a Shakespearean actor was a brave choice that worked out well. I think he is most believable as a (space)Navy captain. J-L P. Far and away, head and shoulders above all the rest. I've been sitting here for ages trying to make up my mind and I can't! Too many good ones. Oh! please........... there is no other! !